Eunjin Mireuk becomes 7th national treasure as Goryeo Buddha statue. February. 14, 2018 07:50. by Won-Mo Yu onemore@donga.com. 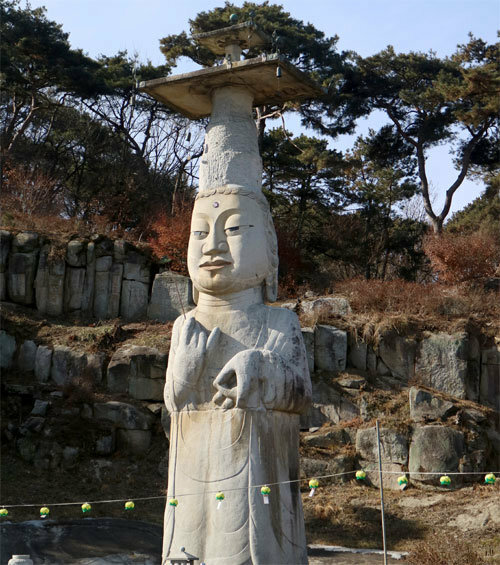 “Eunjin Mireuk Buddha,” the tallest standing stone Buddha in Korea, which was built during the Goryeo Dynasty, will be elevated to national treasure status. The Cultural Heritage Administration Tuesday announced that it would designate Seokjo Mireukbosalipsang Buddha (the Standing Stone Buddha Statue) of Gwanchoksa Temple (previously designated as Treasure No. 218) in Nonsan as national treasure. The statue, which is widely known as “Eunjin Mireuk Buddha” as it is located in Nonsan’s Eunjin village, is 18.12 meters in height, the tallest in Korea. This Buddha statue is wearing a cylindrical coronal on its head. Its large head and face with strong features make it all the more impressive. Unlike Buddha statues in the Unified Silla Dynasty, which pursue refined and ideal beauty, it boasts enormous size, massiveness and bold beauty. “We expect the value of Buddhist sculptures built in the Goryeo Dynasty to be reeval‎uated by elevating the most valuable one among Buddha statues to the national treasure status,” the administration said. The Cultural Heritage Administration will have a 30-day notice period and decide whether to elevate the status of the Buddha statue after collecting extensive opinions.